From the house where I stayed in Kabaré (Cabaret) -- just north of Port-au-Prince, April 2011. A young friend keeping me company at Souvnans, April 2011. 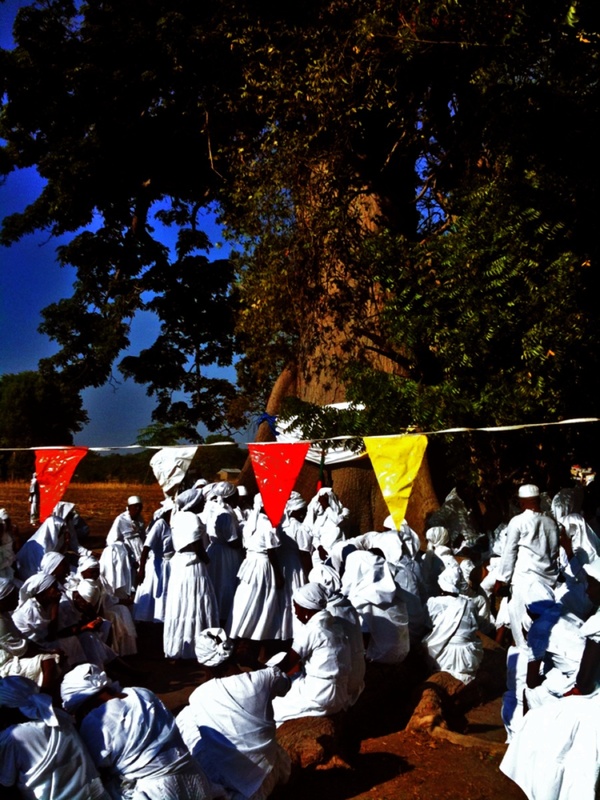 Ounsi (practitioners) at the Mapou tree, Souvnans. Procession back to the peristyle, Souvnans, April 2011. With friend, travel, and performance partner Neg Mawon looking at land for an organization we co-founded, Neg Anba. In downtown Port-au-Prince with my friend Yatande's mother and sister (photo by Neg Mawon). I've conducted field research in Haiti since 2007. I began studying Haitian folkloric dance at UCLA in 1999 and continued in New York City in 2002. My first proposed trip to Haiti aligned with a controversial coup d'état and the resulting forced resignation of President Jean-Bertrand Aristide during his second term in office in February 2004. This was a particularly unstable time and so I postponed my first trip until I had the opportunity to travel with friends to Port-au-Prince and Sodo (Saut d'Eau) in July 2007. Sodo (Saut d’Eau), meaning waterfall, is a place and annual event paying homage to the siting of the lwa, Vodou divinity, Ezili Dantò syncretized with the Virgin Mary in a tree near these waterfalls at the end of the 19th century. On the road from Sodo with Dawomey, Catherine Annie, and Ronald to catch a kamyonet (camionette - pick up truck). The masses of people in the sacred falls. Part of the waterfalls of Sodo (Saut d'Eau). The neighborhood where I stayed in PaP: Croix des Bouquets. I returned the following year to visit the site of an annual Vodou ceremony named Souvnans (Souvenance). Souvnans or Souvenance Mystique, as it is written atop the peristil or central house of worship, translates as Mystical Remembrance and references both the location and event. 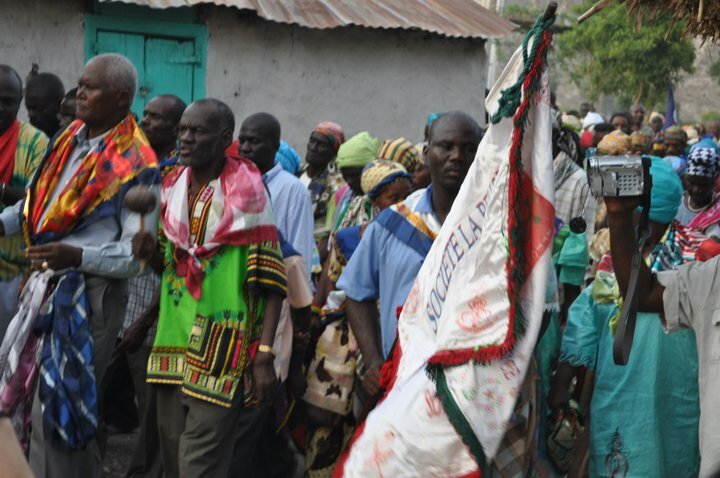 A weeklong public Vodou ceremony honoring the African traditions from Dahomey at the lakou, or family compound of the same name, Souvnans is the best known of three important annual ceremonies and areas for Vodou located outside the city of Gonaives in the Artibonite Valley. I visited Souvnans in 2008 and 2011. Souvnans coincides with Easter on the Catholic calendar and 2015 marked the 200th anniversary of the event. These visits to Haiti have profoundly influenced my life and my work. Navigating the urban landscape of Port-au-Prince and feeling an affinity with its energy and bustle, its geographic expanse yet possibility for chance encounters with friends and acquaintances, reminded me very much of New York City where I had been based for about 10 years. Witnessing and participating in sacred ceremonies and pilgrimages in the countryside of Haiti, getting to know members of these communities, and experiencing a daily way of life profoundly deepened my understanding of the folkloric tradition, opened me up to the contradictions of life supported within the religiosity of Vodou, exposed me to a true sense of the sacred, and revealed the depth and wealth of cultural tradition and arts in the midst of an existence that we as United States citizens would consider humanitarian criminality. Choreographically, I have attempted to address the issues that arise through my experience – the embodied memories characterized by proximity and intimacy as well as the acknowledgment of distance. My scholarship has focused on the relationship landscape plays in rural Vodou. Ritual ceremonies and pilgrimages, which include communion with lwa via individual and group embodied performative actions, may occur within natural sites – especially in rural Haiti – that are distinctly site-specific while also enacting a symbolic history and collective memory for the participants that transcends location. Souvnans has become a large part of my body of work. After my first visit, I edited a 10-minute experimental video while taking a video editing class with Hilja Keading at the University of California at Riverside as an MFA student in experimental choreography. I keep this video unlisted on my YouTube channel because I only want people to access it who have heard more about my motivations for creating it and the context from which the material comes. The video project was driven by my intention to portray the intimacies present in my experience at Souvnans. I was struck by the intimacy between the Vodou practitioners as well as the fervor expressed in their spiritual practices and beliefs. My experience within the choreographed intimacy of bodies practicing Vodou as well as my everyday intimate experiences with the landscape and people motivated the short film. I carry the memory traces of the embodied enactments at Souvnans with me and have choreographed them into a ten-minute digital memory that seeks to expose the politics of intimacy and difference within my experience. These are stills from the video (below). Ounsi around the Mapou tree. Souvenance Mystique's faded paint job in 2011. It has since been repainted. Boys approach me and my distancing camera near where we stayed in Souvnans. “The Sacred Mapou: Routes of Memory in the Haitian Vodou Ceremony of Souvnans,” submitted August 2015 for inclusion in the anthology, Dancing the African Diaspora, edited by Dr. Thomas DeFrantz, Duke University. “Roots/Routes/Rasin: Rural Vodou and the Sacred Tree as Metaphor for the Multiplicity of Styles in Folkloric Dance and Mizik Rasin,” chapter submitted March 2015 for inclusion in forthcoming Vodou in the Haitian Experience: A Black Atlantic Perspective, edited by Dr. Celucien Joseph, Lexington Books; Rowman & Littlefield Publishers.